I think it's very thought provoking and I agree with what is in there. I agree that for most people that aren't doing heavy cropping and aren't doing large prints there will be little realized for full-frame. One area the author didn't include, which I would, is extremely high ISOs - 6400 and above. Even at 8x10 level you're going to notice a difference. For everyone else, full frame isn't going to give a noticeable difference. However, what I find more compelling - and what I agree with - the aps-c DSLR is going to get squeezed out. The vast majority of the technology is driving towards mirrorless. I agree with the author that Sony is going to drive it there. The photos I see from people using Panasonic, Fuji and Oly ILCs are really fantastic. The only benefit DSLR offers is continuous focus and OVF. The vast majority of the population is growing up in an ovf-free world. They're used to not having it. The major manufacturers are pushing pdaf focusing and tracking. So, OVF will, I believe cease to be a compelling reason to choose DSLR. So, what I took away from the article is not so much the battle of full frame vs. aps-c - it's DSLR vs. mirrorless. 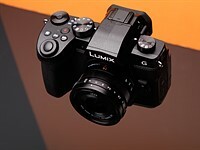 And I agree, long term mirrorless looks like the possible winner.